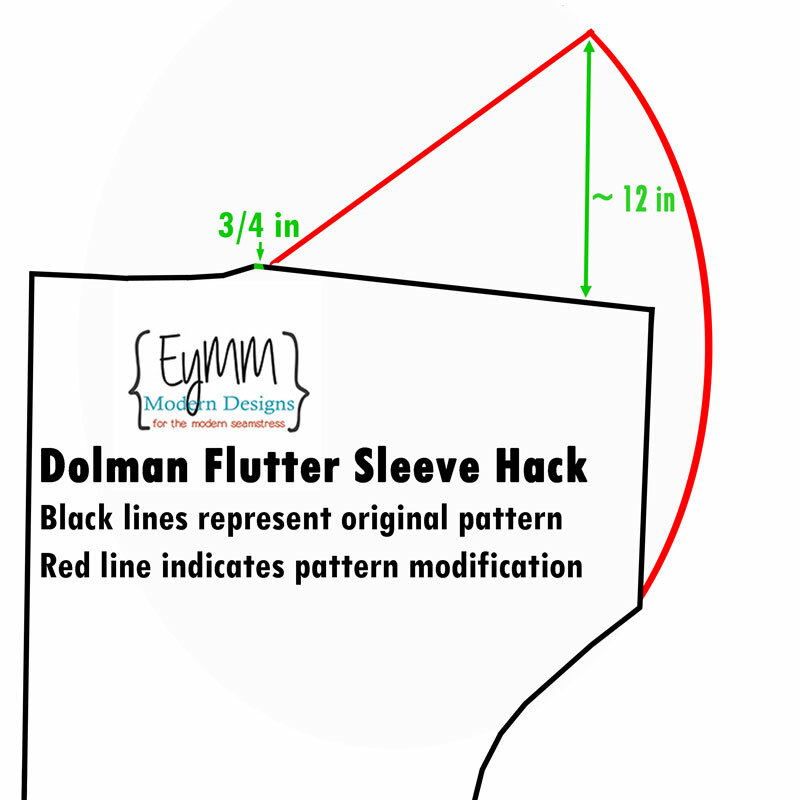 Dolman Flutter Sleeve Hack Attempt #2 – Everything Your Mama Made & More! I’ve been busy these past couple weeks, but carved out some time to make attempt #2 at a flutter sleeve hack on Kymy’s Dolman. I tweaked my modification just like I mentioned during attempt #1 and am fairly happy with the new flutter sleeve. It has a lot more “flutter” than my first try at this hack. To add to it, I decided to finish the sleeves with a lettuce-edge rolled hem on my serger. I like how they feel fun and flirty! This time, I angled the shoulder seam up higher than in attempt #1. I pivoted it at a point 3/4 inch from the neckline in order to leave room to hem the neckline. I rotated the shoulder seam up so the outer end was about 12 inches above the original shoulder line. Then I redrew the end of the sleeve in a soft outward curve rather than using a straight line like I did the first time. This gave my new flutter sleeve hem more fullness and added more “movement” to the finished product. 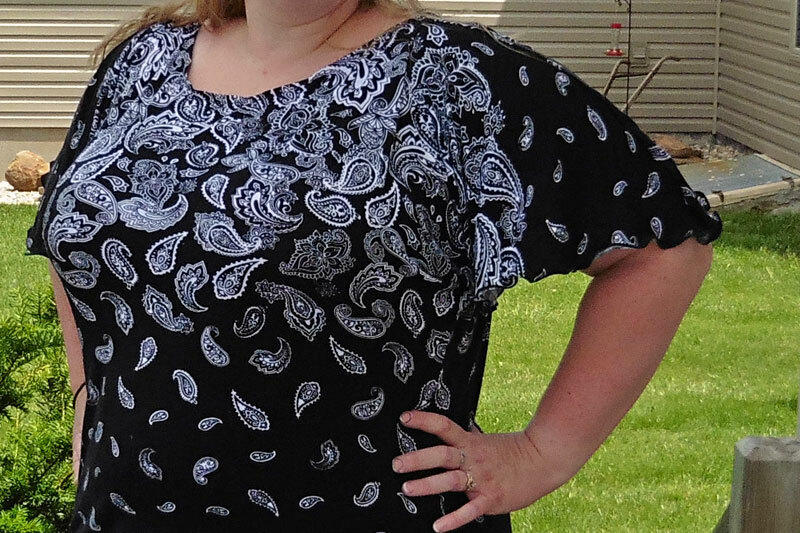 For the body of this shirt, I used Kymy’s Dolman Top in the view E option (this is the same as view D that I usually do, but without ruching the side seams). My new flutter sleeved dolman will be comfortable year round paired with my ‘Get Moving’ Leggings in either knee capri or full length! Thanks for the clear directions for this hack, Joelle. That fabric is beautiful, and the top looks very pretty on you. You’re welcome! Thanks for the compliments! 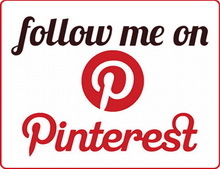 If you try it out, we’d love to see! I really LOVE that top. It looks Great! Perfect with the paisley at the top and bottom. You do awesome work! Joelle, this improved hack definitely looks more like what you were hoping to achieve. And the fabric is nice! Thank you! I’m glad this second attempt worked better!